One of my favorite things to do with the family is creating personalized holiday decor, whether it be ornaments, plates, or DIY Christmas stocking patterns. I love having a lasting memory for each holiday. 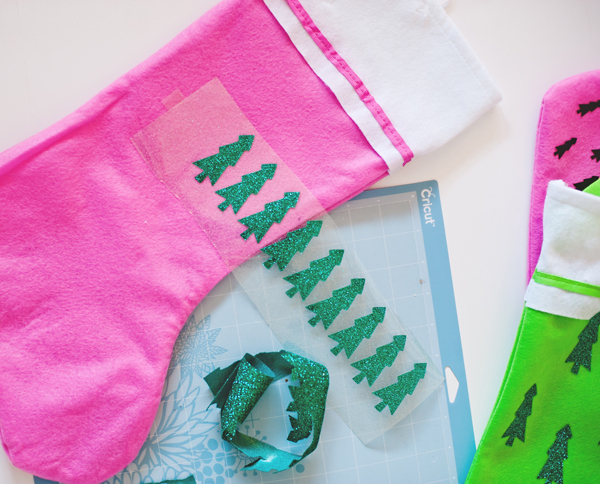 That’s why these Christmas stockings are one of my DIY favorites! 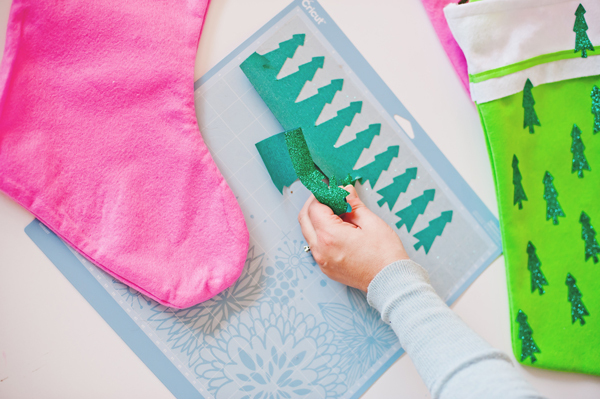 We’ve started a new tradition of making stockings every year. It’s a fun way to create something together as a family and ensure everyone who is coming for Christmas that year will be taken care of. Last year we made big bow stockings. 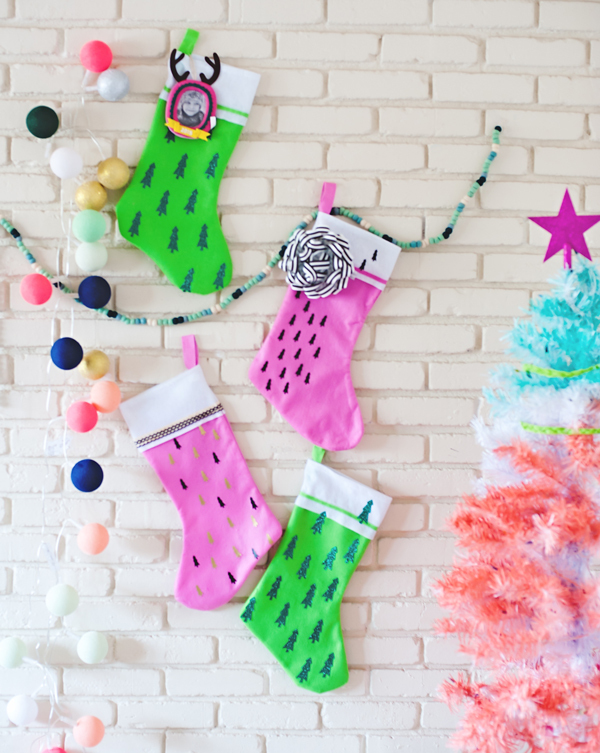 This year we’ve decided on a bright update to dollar store stockings with graphic, glittering trees. I’m so obsessed with these already! I used my new Cricut Explorer One and a few extra pretty trimmings to get these DIY Christmas stocking patterns ready for filling with festive presents. Going all out for the holidays is something I find myself doing year after year. My goal each year is to walk into my home and feel like you have been transported into a DIY winter wonderland. Does that make me Christmas crazy? Eh, I don’t mind, as long as we have a jolly time! 1. 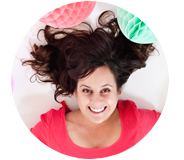 Choose the image you wish to use in Cricut design space. There are thousands of great images to choose from for a project like this. I especially loved the Christmas tree selection. Note: If you don’t own a Cricut and want to still make this project you can still purchase the digital file from Cricuts’ design space and cut the trees out by hand. 2. 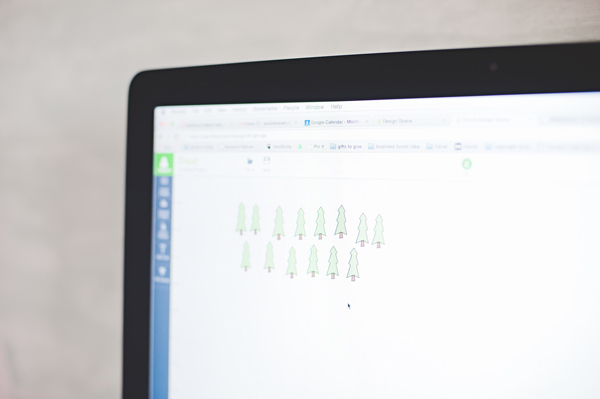 Insert the image into a new project on the Cricut design studio, load the iron on material and let the machine do it’s cutting magic while you watch in wonder! 3. Peel off the negative space which will leave a line of perfectly cut trees for this project. I don’t think I’ve ever seen such perfectly cut trees – this machine is about to revolutionize our crafting projects! 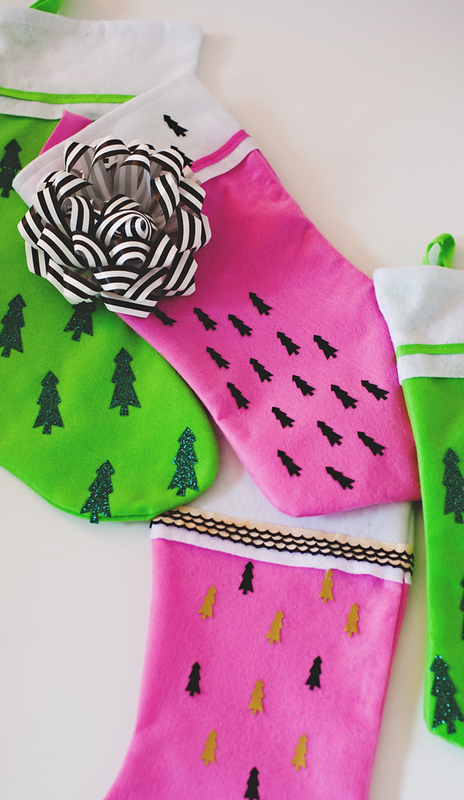 They make the perfect design for your DIY Christmas stocking patterns. 4. 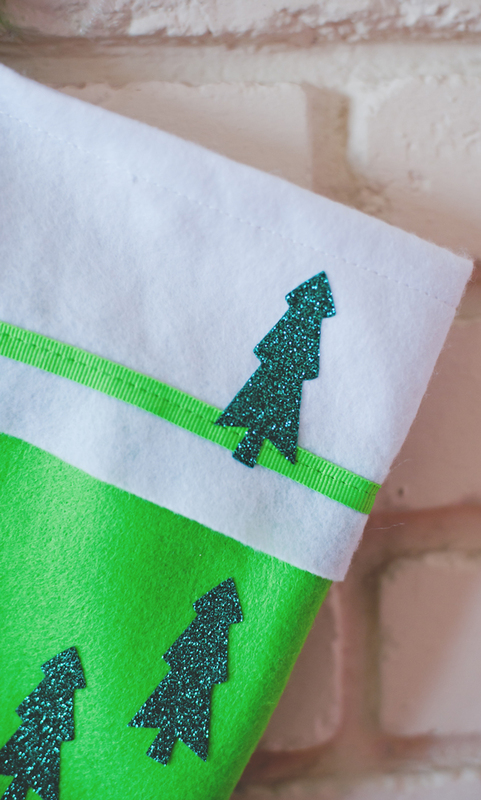 Follow the directions on the iron-on material to place the trees onto your DIY Christmas stocking pattern. 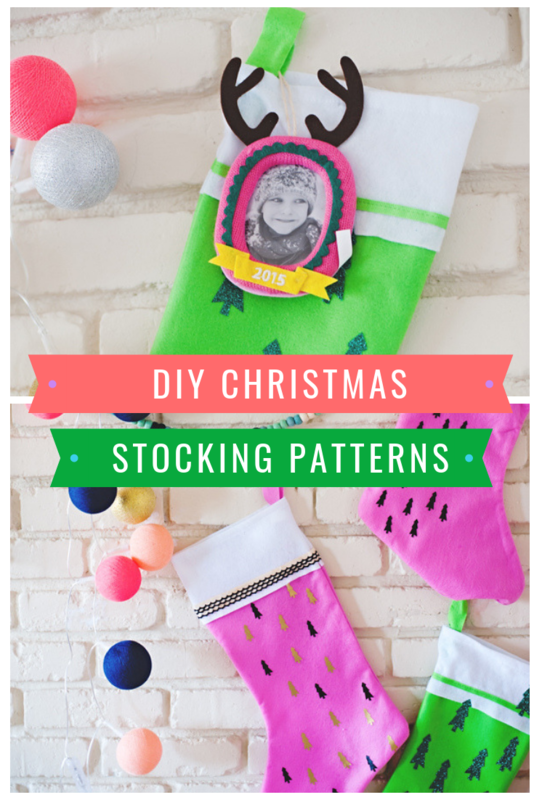 We cut ours to make randomly fun patterns, but the stockings could be made to match any Christmas decor and they are a great way to wrap wonky shaped gifts for giving. Finish off the stockings with ribbon trim, bows and sweet details. 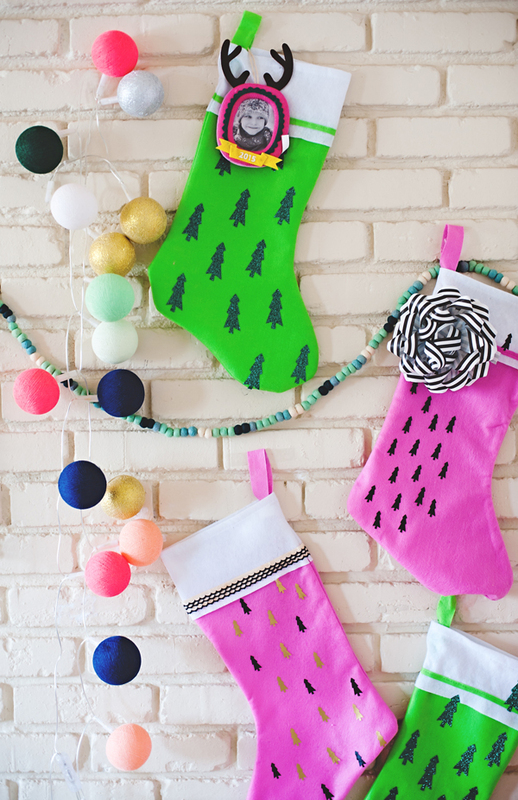 Turn these dollar store stockings into a gorgeously bright mantel display in no time! Let us know what your favorite Christmas decoration is! Do you like to DIY or decorations? The post is brought to you by Cricut, my new favorite crafting supply. Thanks for supporting our holiday sponsors.